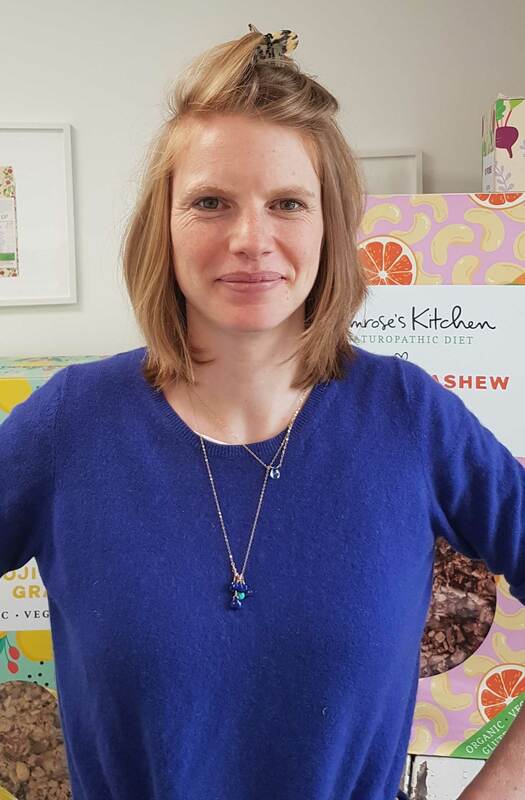 Owner and creator of Primrose’s Kitchen, Primrose Matheson lives her life by the philosophy behind her range of organic, vegan and gluten-free muesli and granola. She uses wholefood ingredients, including fresh vegetables and fruit that have been air dried at low temperatures to create delicious, healthy superfood that nurtures the soul. This is paired with a passion to respect the planet; all packaging is home-compostable and ingredients are sourced from British farmers, where possible. Set up five years ago from her kitchen, when she was living in Rampisham, Primrose originally created the muesli for her own use, using her background in naturopathy and homoeopathy, believing what you get out of your body reflects what you put into it. She then started to sell at farmers markets and supplying local delis and shops. However, a turning point in the business was when Primrose’s Kitchen appeared on the shelves of Waitrose. She now has a team sending her range of products, in their colourful packaging, all over the UK and even to France, Spain, Finland and Canada. As Primrose feels your working environment should be a reflection of what’s important to you, she took her time to find her HQ. At Eden Park, outside Buckland Newton, the workspaces are light and airy, in a rural location, with greenery and room to grow. And Isla, Primrose’s dog is in charge of general zen in the office. Commuting from her cottage just outside of Bridport, Primrose grows as many vegetables as she can in her garden and lives as self-sufficiently as possible. From a childhood in Guernsey, she picked up some fishing skills, and can often be found with her rod on Cogden beach. If she’s not on the beach, she’ll be in the sea, as a daily swim in the summer and autumn months is a must for Primrose. With a keen interest in wanting to know more about what surrounds her and live in line with nature, Primrose has learnt about foraging, willow weaving, natural plant dyes and plans to go on a hemp weaving course next year. Based on her philosophy that you get out what you put into life, this bubbly ‘tour de force’ is an inspiration to all who taste her products.